My look back at the year in housing on my blog concludes with five more big issues including the future of social landlords, welfare reform and poverty. For Part 1 go here. Nothing sums up how just much turned on the election result as what happened with the Right to Buy. In February I blogged about the clarification that meant even fewer homes sold under the existing policy were being replaced than previously thought. April brought a buccaneering Tory pledge to extend it to housing association tenants and fund it by forcing councils the sell their ‘expensive’ stock. It was hard to see how it could possibly stack up except as a political gimmick but that was pretty much the point. It was an eye-catching election promise by a party desperate for victory and it seemed designed as a manifesto commitment that could be traded away in coalition negotiations. Except that it worked. The Tories were unexpectedly elected with an overall majority and the mash-up of think tank proposals written on the back of an envelope somehow had to be implemented. The results would be disastrous for local authorities and the government faced a long battle in the House of Lords. And then everything changed all over again as the most vociferous opponents of the policy decided to accept it voluntarily. How has George Osborne got away with a Budget that will hurt the very people he claims it will help most: hardworking families? The headlines are all about One Nation, National Living Wage and tax cuts but, as the dust settles, the calculations that have emerged so far make clear that the poorest households are going to suffer significant cuts in income. While a series of cuts such as the lower benefit cap will hit out-of-work households hard, people in work face a series of technical changes to tax credits and benefits that will make many of them substantially worse off. A four-year freeze in working age benefits saving £4 billion by 2020/21. The Institute for Fiscal Studies estimates that this alone means that 13 million families will lose an average of £260 a year. Of those, 7.4 million are in work and will lose £280 a year. The freeze will also hit child benefit, which David Cameron promised to protect. £6 billion worth of cuts to tax credits (and subsequently universal credit) and associated housing allowances from April 2017. The IFS says new claimants will lose credit entitlement for more than two children, losing the average of £3,670 a year that currently goes to 872,000 families (548,000 in work). On top of that, the family element in credits for the first child will be cut for new claimants and housing allowances associated with both will be cut too. Kate Webb of Shelter calculates that just one change – the removal of the family premium, an allowance of earned income before housing benefit starts to be withdrawn for working families with children – could cost a single mother working 20 hours a week at the new national living wage £11 a week. That’s not much less than the bedroom tax. Cuts to work allowances that mean working households will lose tax credits/universal credit much more quickly than now. At the moment, credits start to be withdrawn once family earnings rise above £6,420. That will fall to just £3,850. This will cost 3 million working families just over £1,000 a year each. Credits will also be withdrawn at a faster rate once they hit that threshold. 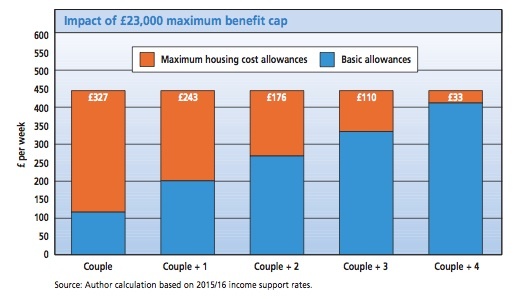 Worried about the impact of the benefit cap, social landlords? You should be because what happens next seems to be your responsibility. Effectively that means larger families will be priced out of even social housing throughout the UK and a couple with three children will not be able to afford the average housing association rent anywhere in the Midlands or South of England. The impact will be felt far beyond inner London and the CIH estimates that four times more households could be affected than under the current £26,000 cap.